The Center of Innovation program at the College of Applied Science at UC aims to show seniors that their choices for employment upon graduation is not limited to Fifth Third, Kroger’s, and Great American Insurance (not that there’s anything wrong with those fine companies). The program also aims to show them that, in a region full of marketing, design, and business talent, there is serious need for young technology talent with an entrepreneurial bent. For those who might want to take the plunge, the program also outlines business skills and resources they’ll need to complement their technology skills. This is a great thing, and kudos and support goes to Andy Erickson and Dr. Hazem Said for their work so far. This past Tuesday I gave a short talk to students in the Innovation Seminar series in CAS at UC about what’ it’s like to work in a startup from a coder’s point of view. I talked about transitioning from a cubicle farm job to a startup environment, the nature and pace of working in a startup, and the tons and tons of learning that is inevitable. You won’t get a lot from these slides without the narrative, but I post all my talks here so I thought I’d post this one. Cross-posted on my Cincinnati blog. View more presentations from Gerard Sychay. This past Thursday I gave a short talk at the monthly OINK-PUG meeting about how I discovered the Test-Driven Development Kool-Aid®. I knew about TDD years before I actually started doing it. I tried to start several times, and never kept it going. About a year ago, while developing a web service with no screens, the light bulb went on and gave me the idea for this talk. In which I give a short introduction to unit testing, and then outline the story that finally turned on the light bulb about real test-driven development and test first for me. The third part of the talk gives an introduction to Dependency Injection (DI), an integral part to unit testing. 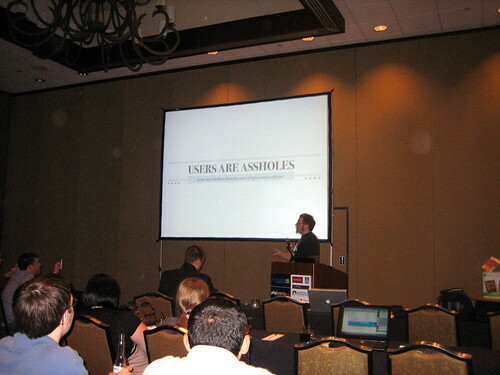 Slides from php|works 2008 in Atlanta, GA. If the Sliderocket version below is problematic, here is the more popular Slideshare version.